We've always been understandably curious how a wrestler manages to have multiple lives. Does he have a secret stash of 1-Ups from the Mushroom Kingdom? Turns out he might just transfer his soul from one body to the next to maintain that endless victory! Become the next host of the power of the Undertaker with this WWE Undertaker Wrestling Mask. This latex mask has truly frightening detail and will make you look just like the popular wrestler. All his iconic looks are featured including the long dark hair, intimidating goatee, and the frown lines that come from having so many enemies. Lock in on some dark eye contact with the cutouts for your vision. Just watch out for Kane! 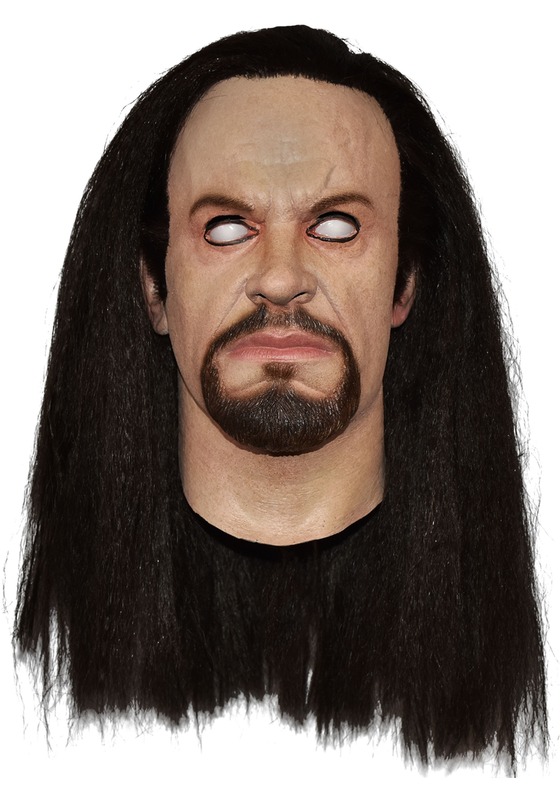 Keep the darkness alive with the ever-returning Undertaker thanks to this Wrestling Mask in his image. Like Voldemort and his Horcruxes, you'll help this wrestling necromancer return to life and gain another bit of vengeance from those who dare defy your and his dark powers combined!